For some...it brings memories of gupshup with friends over cutting chai and bhajiyas. To some, it may bring memories of dancing in the rains unaware of the world around them. And for some it reminds them of their first kiss..! The smell of the wet soil, the wet roads, the wet and shabby birds taking shelter under the window panes..all these visuals remind me of the starting of school. Having to go to school away from Mom, sacrificing on my afternoon siesta and the feeling of itchy wet feet while I sat in the classroom listening to my teachers... made me sad. And it is this exact feeling that I get whenever Mumbai Monsoons arrive. Only if I was a little more fun and interesting. 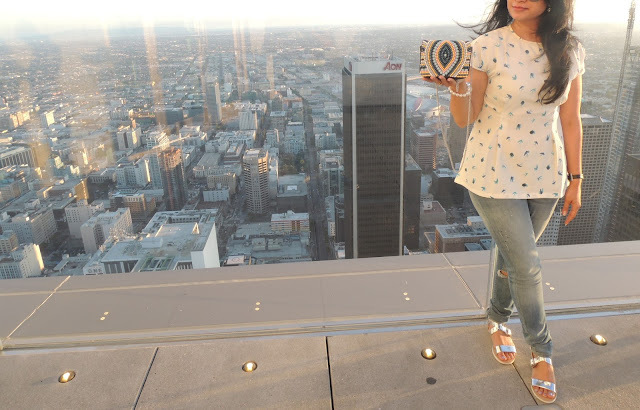 Anyways, below are pictures of an outfit which I had worn for a day out in the fabulous city of Los Angeles. Hope you like it. Nice location and of course pretty you! Very pretty! The nail paint is simply gorgeous! I've never experienced a monsoon before!! Very nice. I also find that I associate some weather conditions with memories. I am always so fond of cold weather.